A little bit in the future, the government has established a brand new organization with the purpose of rescuing lives to respond to the increasingly complicated and varied types of disasters, accidents and crimes that go beyond human comprehension. It is called the "Mobile Emergency Police DRIVE HEAD" force combining specialized police, firefighting and rescue skills. "DRIVE HEAD" is an advanced mobile device that transforms in form factor from car to humanoid walker vehicle. 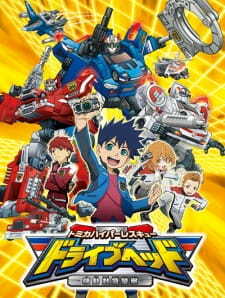 The drivers are high-aptitude, grade school students such as Go Kurumada who collaborate with mobile emergency police adults and rush to crisis situations to secure public safety and preserve the peace for all!